So Greece will get €44bn more from the last bailout plan… for the Greeks ? Obviously not : €23.8bn will directly go for private banks recapitalization, most of the rest will go to debt repayments. Long story short: again, we are giving free money to bankers with more public debt that citizens are kindly asked to repay. “Otherwise the banks would go bankrupt”, they say. OK, but this is not a sufficient pretext for giving money without any compensation for citizens who are paying the price for it. Otherwise, this is pure moral hazard, without any kind of responsibility involved. 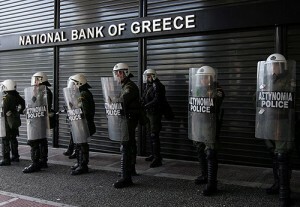 Fortunately, there is a very simple solution : ok, let’s recapitalize the banks… but in compensation for the extra and unfair support given by the Public to private bankers, let’s then distribute free banks’ equity shares (newly created) to EVERY greek citizens. That way, not only People will have a voice at the banks’ general assemblies (while diluting the share of ancient shareholders – those who failed managing the bank), but also if greek banks get profitable someday, then every greek citizens would get some dividend for it. Last but not least, this might disincentive some people to withdraw their money from their bank, now that they have a stake in it.